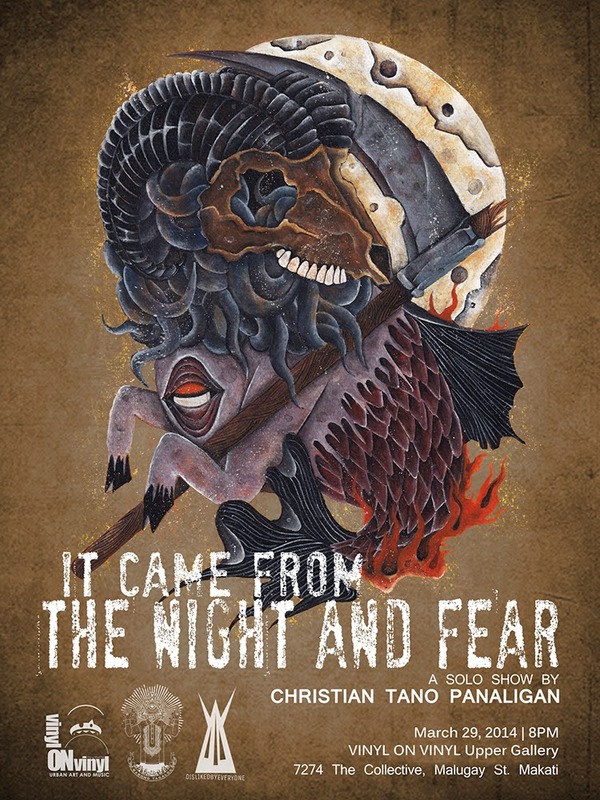 VINYL ON VINYL: MARCH EXHIBIT SPACE | It Came From the Night and Fear by Christian 'Tano' Panaligan on March 29! MARCH EXHIBIT SPACE | It Came From the Night and Fear by Christian 'Tano' Panaligan on March 29! When he was a little boy, instead of hiding under the safety of his blankets, Tano has always found himself seeking the creatures bedtime stories were made of. From the night terrors that lurked in the shadows to the little creepers that lay just out of sight, 'It Came From the Night and Fear' is the stuff of childhood nightmares. It is a 20-piece collection of acrylic work on paper brought to life by the runaway imagination and the two very eager hands of Christian 'Tano' Panaligan.